Do you know you can get all the knowledge you need for growing delicious and healthy vegetables easy, all in one place? The pocket digital gardening assistant Tomappo, including the mobile app and the web portal, takes you throughout the gardening season easily and concisely. The app was created by a team of young Slovenian professionals from different areas who know how discouraging searching for information in overloaded gardening forums and thick manuals can be for gardeners. 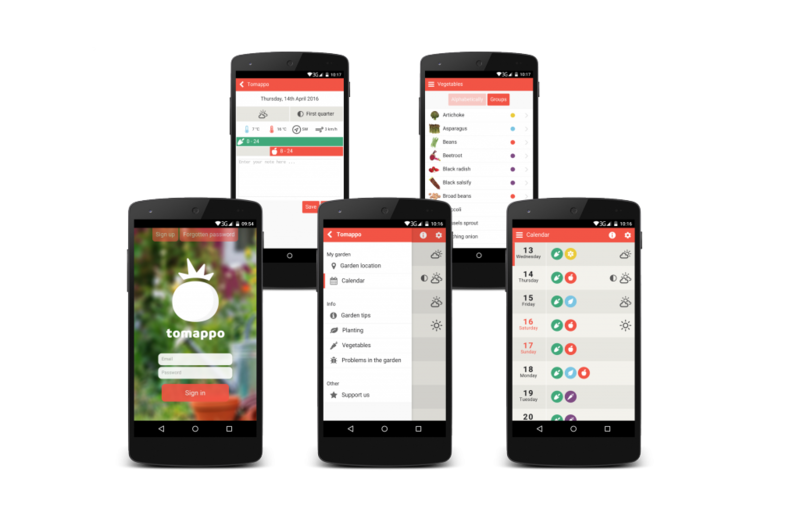 Tomappo plans your gardening chores to let you enjoy more time among your veggies in the fresh air. The app is now available in English as well, on Google Play and Apple Store. The main part of the app is a sowing calendar where you can check the right days for work with individual garden plants and save your notes on the activities and methods that bore fruit, for the following season. However, in comparison to other gardening apps our variety offers more. It delivers accurate weather forecast exactly for your garden location, offers reminders for garden chores option, and gives advice on fertilization, pests control, optimum location for garden plants and more useful information. The app is adjusted to individual regions and will not recommend planting mangoes or papayas, where these won’t succeed. In Slovenia, where the idea was sown and cultivated, the app has been downloaded by more than 10,000 gardening lovers, which means every 25th gardener already has it! The Tomappo users circle is growing very quickly; in the second year since its release their numbers have doubled. More than 13,000 people follow the contents on our web portal, which proves that Tomappo is not only serving itself but is well adjusted to the users’ needs – both content and price-wise. The loyal garden assistant is free, the only payable content is the garden planner and even that is cheaper than any printed manual. The team that created the app includes, in addition to the above mentioned creative manager, program developer Marko Novak, MSc, legal expert Tilen Blazica, BSc, and meteorologist Vanja Blazica, PhD. When preparing the contents for Tomappo, we have cooperated with accredited experts from the Chamber of Agriculture and Forestry of Slovenia and Slovenian Environment Agency. We have also drawn information from the most important gardening manuals by renowned authors from different countries. You can get more information about us and our mobile app online at www.tomappo.com. We are available for all additional explanations at info@tomappo.com as well.